My etsyshop Handcrafted Histories for ready-made items, gifts etc. Think about what kind of clothes you want, and try to give me as much details as possible (pictures are nice) and also, what you will use them for (reenactment, stage, market fair, winter camping.) This way I can give you a better offer. I always prewash and iron the fabrics (except silk, velvet etc) before sewing, and only use high quality fabrics, threads and details. The hand seams are made with historical techniques. Care instructions are provided, and washing advise is always free if needed. No chemicals are used during the making, which means a healthier garment, but you might need to iron it after shipping. Machine sewed inside seams and hand stitched hems, details and visible trims. All hand stitched garments upon request. Pattern constructions are based on viking/medieval finds, but gores/seams may be adjusted due to your measures and to cut costs. Garments based purely on archeological finds upon request. Here I answer some common questions on ordering clothes in Swedish: Läs gärna det här inlägget om dräktbeställning och Här svarar jag på vanliga frågor. Linen shirt, shift, tunic: from 800kr/ 80 E including prewashed 100% linen, machine stitching on inside seams, hand stitching with linen threads on hems. 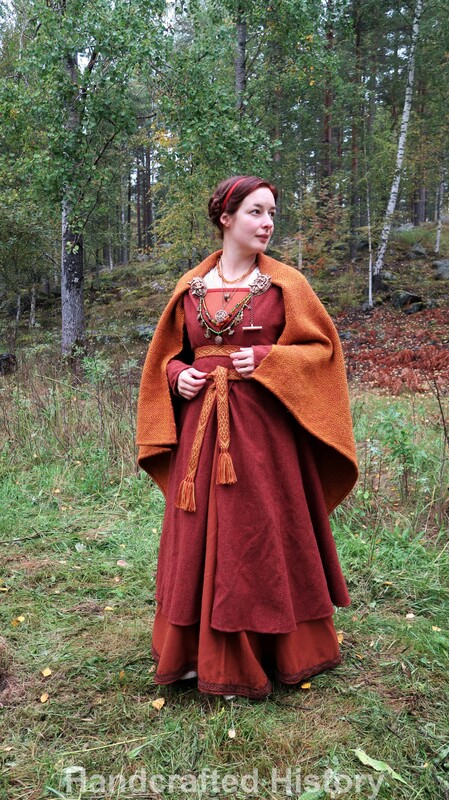 Woolen shirt, tunic, kirtle, apron dress: from 1600 kr/160 E including prewashed 100% wool fabric from Handelsgillet, machine stitching on inside seams, hand stitching with linen/woolen threads on hems. We pick out the best fabrics for your order together; these links are just some good examples of high quality fabrics within the pricerange offered in the examples. A personal fitted pattern that I draft on your body, for you to use as a pattern for your own sewing. Upper body from 65 E + sleeves, total 85 E. Available on markets/events I’m attending, book me in advance if you are interested. Fitted garments: To sew a fitted garment, I need to be able to try it on you at least once. Only available on request if we can arrange a meeting. Hoods, liripipe hood, Sköldehamn hood: from 500 kr/ 50 E including material. Hand stitched hoods: from 800 kr/80 E including material. Buttoned, dagged, embroidery hoods: from 1200 kr/ 120 E including material. Hats: from 450-550 kr/ 45-55 E from including material and trims. Bags in fabric such as pilgrim bags, Martebo bags, pouches, silk purses etc: 400-500 kr/ 40-50 E including material. Hand stitched short cloaks or semicircle cloaks: from 1400 kr/ 140 E including material. Most of my tutorials are free, but some are for sale. These are high quality ones that have been tested before selling them (on younger children, sewing newbies + friends and my husband). Full sized patterns, easy step-to-step instructions, lots of pictures, tips and tricks and a list of which materials and tools you need. To order; send me an email at linda.handcraftedhistory@gmail.com with shipping address and preferable method of payment (swish, bank transfer, paypal) or visit my Etsy shop. Order a gift card (free shipping inside Sweden or free as a pdf. outside Sweden) and give away to a friend! Fancy looking, nicely crafted and with an amount of your choice. The gift card is valid 1 year after the purchase and you will recieve a code as a proof of buying it. Good for ordering clothes, shopping on my facebook shop/second hand items, on markets were I’m with my shop or to order a personal workshop. Hej, är intresserad av huvudduken! Hej! Jag är intresserad av jackan, vad är det för storlek på den? Är intresserad av den gröna tunikan och bruna byxorna. Finns dom kvar?